Cache at Surprise View, in the Derbyshire part of the Peak District. Cache is an ammo box hidden in the rocks, a torch is recommended. Please replace the cache in its original position as this is a popular spot, and the cache has been muggled a few times already. As well as looking for the cache, I strongly suggest a play on the rocks and taking some time out to look at what I think is a beautiful view. Little (and not so little) cachers should be careful,the rocks are high and hard. Falls can be painful or worse. This cache was placed with the kind permission of Sheffield Council. 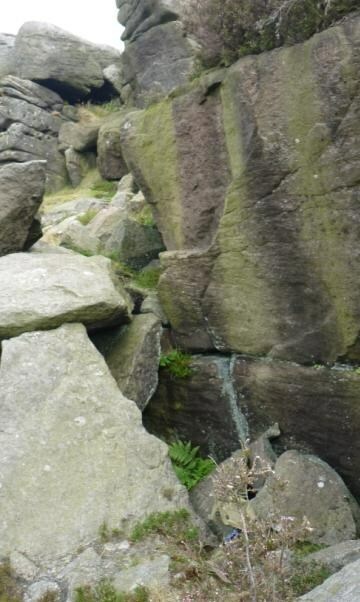 The area around the cache site is a Site of Special Scientific Interest (due to the ground nesting birds in the area) so please stick to the area around the rocks, don't go tearing up the undergrowth, and please take your litter home. Ybbx sbe gur qnexrfg pbeare, gurer lbh ner. Spoiler PhotoThe hole behind the braken.